Here is a short excerpt from chapter One. Most of us I think would say that over our lifetime we have only received a handful of answers to prayer. But that’s not the way it should be. God purposed from the beginning that answers to prayer be the rule, not the exception. His idea of prayer was, and is, to be a regular, daily means for us to receive from Him what we need and desire in order to do His will. In fact, Jesus has promised us in John 15:7, “If you abide in Me, and My words abide in you, you will ask what you desire, and it shall be done for you.” Yes, God wants to give you the very thing you desire and ask for. And He will, if you meet the conditions—to abide in Him and let His words abide in you. Prayer was never meant to be an end in itself—not an exercise to glory in, to impress someone, or even merely for communion and enjoyment of God, though that is part of prayer. Rather, the main purpose of prayer is to glorify God when we receive from Him the things we ask for (Jn. 14:13). And that is what we should expect when we pray—that He will give us exactly what we ask for, nothing else, nothing different. 1. In all of Jesus’ teachings on prayer He has emphasized strongly that we can receive answers. In Jesus’ Sermon on the Mount, in Matthew 7:7-11, Jesus instructed His disciples on asking and receiving. He told them that if they will just ask, He will give to them, if they seek they will find, and if they knock the door will be opened to them. Here it seems that asking, seeking, and knocking are all ways of asking, asking that gets more and more intense. Seeking is more intense than regular asking, and knocking is more intense than seeking. But I think this passage is teaching more than just our intensity in prayer. I see this kind of prayer as a progression of prayer that involves us in the process. God wants us to be involved in prayer, in bringing about the answer. He doesn’t just want to hand us what we desire on a silver platter. So here Jesus I think is teaching: ask what you desire, but then when God gives you some insight into what exactly He wants to give you, go out and seek for it—put some feet on your prayers. Then next, when you think you have found what you have been praying for, knock on the door. And when the door opens, test it to see if it is what God wants you to have. An example of this kind of prayer would be when we are praying for a job. We would begin our prayer by asking God for the kind of job we desire. But it doesn’t end there with verbal asking. We don’t just keep asking and not do anything. No. The next thing we naturally do when we desire a job is to “seek”—to look around for a job. We would look in the paper or on-line at the help wanted ads, etc. But it doesn’t end there. We would get on the phone and call places that interest us and then go and talk to the person offering the job. That’s the knocking part of prayer. So we don’t just sit on the couch and pray! We put feet to our prayers! God wants us to be involved in the process of prayer. The basis for God’s answers, Jesus explained (vv. 9-11), is the fact that He is our Heavenly Father and He loves us. His love and goodness is far beyond that of our earthly fathers. Jesus’ teaching here is that if our earthly fathers who are sinful give us every good thing that we need and ask for, how much more will our Heavenly Father give to us when we ask Him. Here again, as in the first story, the teaching I believe is that of contrast. If the earthly, unjust judge gave justice to the woman because of her persistent pleading, God as our judge will certainly give us help when we pray, and much more speedily, because He is good and just. Notice, in all of the above verses, the emphasis Jesus puts on our receiving—that if we have faith, or abide, or ask in His name, we will definitely receive what we ask for. He says, “…you will receive” (Matt. 21:22), “…you will have them” (Mk. 11:24), “…I will do it” (Jn. 14:14), “…you will receive…” (Jn. 16:24), and “…it shall be done for you” (Jn. 15:7). There is definitely no uncertainty in these teachings of Jesus that God will give us what we ask for when we meet the conditions (Italics added for emphasis). 2. God has made it our nature to ask in prayer in order that we may receive. We are not speaking of the old nature here. It is not in the sinful nature to want to pray and expect answers. If you are without God you never want to pray, and when you do pray you are surprised when answers come. But when we invite the Holy Spirit to fill us and when we learn how to pray from Him, God works in us the desire to pray and expect answers. Therefore, it is the new nature in us that desires to pray and to receive answers. Paul tells us in 1 Corinthians 3:16 that we are temples of God and that the Spirit of God dwells in us. He was of course speaking to only believers; God’s Spirit dwells in each believer. He dwells in us individually, but also corporately—in the church (1 Pet. 2:4-5). In Matthew 21:13 Jesus said, “My house shall be called a house of prayer…” In that context He was speaking of the Jewish temple. However, I think we can also conclude that since we (individually and as a church) are temples of God, Jesus was also speaking to us. Yes, in our new nature, we naturally want to pray and to receive answers, because He has made us a “house of prayer.” In this house of prayer, where the Spirit dwells, He will give you His heart, His desire. And when we lift that desire up to God, when we ask Him according to that desire, that is what prayer really is. Now when I said God gives you a desire I did not necessarily mean only a desire to pray (though that is included). God will give you a desire for a specific thing that He wants you to have, or for a specific change to take place in you or another person. That desire for that thing will naturally bring you closer to God, fill your heart with joy, and give you confidence that what you are praying for will happen. For if He gives you the desire for a thing then we know it is His will and we will feel His abiding presence with us. In Hebrews 11:6 we find the clear teaching that God is a rewarded of those who diligently seek Him. This is His nature. This is who He is. He is a God who listens to our prayers and rewards us with an answer. He answers the prayers of all His creatures who cry out to Him for mercy and for daily needs. Look out and see how God has fed and clothed the whole earth. Not even the little birds lack food and shelter (Matt. 6:26-28). He answers the prayers of Christians in particular because we are His own special people whom He died for and whom He has adopted into His family (1 Pet. 2:9; Eph. 1:5-7). What a good Heavenly Father we have. He is always watching out for us. He cares for all our needs and wants because He loves us so much. Furthermore, when we receive answers from Him, it not only strengthens our own faith, but it plants the seed of faith in others around us who have witnessed His answers. This was Elijah’s expectation for the people of Israel—that when they witnessed what God would do they would believe. Thus he prayed, “Hear me, O Lord, hear me, that this people may know that You are the LORD God…” (1 Kin. 18:37). But it not only gives us confidence and proof; it gives those around us proof. Surely, those around Elijah knew, because of his answered prayer, that he was a man of God. When people around us see how God answers our prayers they will also regard us as men and women of God. When this happens (and it will) we must always be careful to give God the glory so they will praise Him and not us. 5. When we receive His answers we share in His work and will. God has chosen us who believe to bring to pass His will on earth. But we can’t do it under our own power. He has designed that we accomplish His work and will through prayer. That is, through prayer He will give us strength, wisdom, confidence, and any help we need to accomplish His work. In Luke 19:10 it says, “For the Son of Man has come to seek and to save that which was lost.” When we allow the Holy Spirit to fill us, we in effect are joining Jesus in His work of seeking and saving the lost. And when we pray for the lost and He answers our prayers, we can know that His work is being done though us. 6. Answers to prayer bring God glory and bring us joy. In John 14:13 Jesus said, “And whatever you ask in My name, that I will do, that the Father may be glorified in the Son.” Then in John 16:24 Jesus said to His disciples (and to us), “Until now you have asked nothing in My name. Ask, and you will receive, that your joy may be full.” Here we see clearly that the purpose of answered prayer is to glorify God, that He would be glorified in the Son. But we see also that the outcome for us is that our joy is made full. I believe that when we pray in the Holy Spirit, according to His will, this will always be the outcome for us. For when we are used in the service of God to bring Him glory by our prayers, the Holy Spirit will always fill us up with joy. That is what will naturally happen. It is the joy of the Holy Spirit bubbling up in us; it is the overflow of the glory of God in us. Now what we are talking about is not prayer itself. The act of prayer, the obedience of prayer, does not necessarily bring God glory. Prayer is what is expected of us, but it is the answers that come from our prayers that bring Him glory and us joy. The whole point of prayer is to get answers. 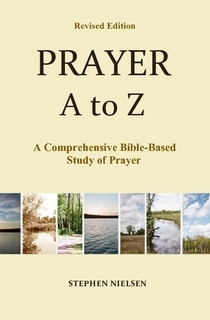 This entry was posted in About Prayer A to Z and tagged a book about prayer, bible study, Bible study on prayer, prayer, Stephen Nielsen, study of prayer. Bookmark the permalink. Thank you so much! It is a journey. Pray I will be able to keep it up.